The most awaited traditional and colourful event will be presented on 17th November by students of Lalitha Kalalaya School of Bharatanatyam. To add unique experience each year to the audience, There will be a few surprising performances. Nearly 100 students are going to perform on the stage with a great passion and enthusiasm. It includes solo performance by seniors and various group performance by students from different stages of learning. Debuting their stage performance will be the enthusiastic “Mom’s batch,” the latest addition to our regular classes. Free entry for kids below 5 yrs and no separate seat will be allocated for them. 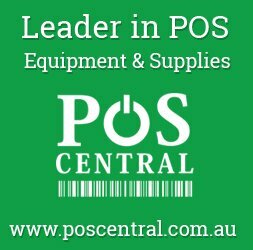 Food has to be pre-booked. Snacks will be available for purchase. Ample free parking available at the venue. 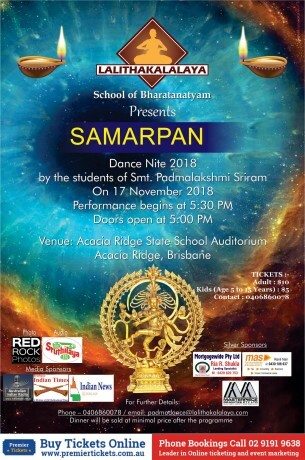 Premier Tickets Australia is proud to be the online ticketing partner for Samarpan Dance Nite 2018 @ Acacia Ridge State School, Nyngam Road, Acacia Ridge, Queensland 4110.